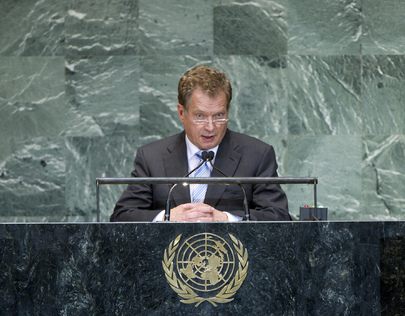 SAULI NIINISTÖ, President of Finland, said profound change was sweeping the globe. Rapid economic growth in the global South had created greater well-being for hundreds of millions of people. Many people had the chance to lift themselves out of poverty and still others had a chance for political participation. At the same time, the tectonic plates of economic power were shifting, and global instruments were needed to manage that shift. A number of “G-Groups” had an important role to play in making the United Nations a more dynamic and relevant player in the world economy. Finland supported the United Nations because it was in its national interest to do so, he said, underlining its unique legitimacy as a genuinely universal forum for cooperation. Finland was a candidate for non-permanent membership to the Security Council for the 2013-2014 term, and would approach issues on the Council’s agenda as an engaged Member State looking for even-handed solutions. “We believe that as a small and militarily non-allied Member State, we have got what it takes”, he said. The ability to prevent conflict was the United Nations core mission and Finland had participated in United Nations peacekeeping as long as it had been a Member State. The country was fully committed to continue that contribution. While peacekeeping was indispensable, soldiers also were needed to secure the conditions for peace to begin, which was why Finland had long paid special attention to civilian crisis management. Effective mediation was also a must and Finland had made a strong contribution in that regard, notably with an Assembly resolution, initiated by Finland and Turkey, last year on strengthening the normative basis for mediation. Respect for the rule of law was part and parcel of building peace in post-conflict societies and it required States to condemn all violence. Finland and the Nordic countries would again introduce a resolution on the protection of diplomatic missions. Turning to poverty reduction, he said Finland had been a reliable partner for developing countries for over half a century, having increased its development cooperation over the past ten years to an annual $1.5 billion. Finland also had supported the Non-proliferation Treaty and was prepared to host a conference this year on the creation of a Middle East Zone free from nuclear weapons and all other weapons of mass destruction. Further, it was ready to place the Finnish Institute for Verification of the Chemical Weapons Convention at the international community’s disposal, should the need arise in the Middle East. As a co-sponsor in the Arms Trade Treaty process, Finland continued to reach out for a substantive and as nearly universal treaty as possible. On other matters, he said the United Nations had been “instrumental” in laying the groundwork for a hopeful future in Libya. But, the situation in Syria was tragic and the Security Council had been unable to take a leading role under the Charter. Council members must find a way out of that crisis, as the United Nations’ authority would suffer if efforts to end it moved elsewhere. In the broader Middle East, a two-State solution involving an independent, viable and contiguous Palestinian State living in peace and security with Israel was slipping out of reach. “The negotiations must restart,” he said, with a view to creating a Palestinian State and respecting Israel’s security concerns. Voicing hope that elections would see Finland entrusted with power and attendant responsibility in the Security Council for two years, he said Finland would work constructively and pragmatically, in order to maintain and strengthen international peace and security.